Janska® Wellness Wear has impacted thousands of lives with clothing that comforts. The founder had an idea for a jacket that would be easy to put on, and that would offer warmth and comfort to her friend who had become disabled from a series of strokes. This new garment restored her sense of personhood, kept her warm and comfortable, and became a cozy friend during her most difficult days. Janska's company mission is to positively impact the physical and emotional well-being of others with Clothing That Comforts. Caregiver Products is proud to provide comfortable and stylish adapted clothing from Janska® Wellness Wear. 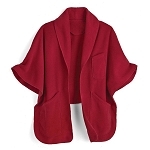 Comfortable wrap with front pockets and an easy to use button. Easy to don fleece jacket, whether dressing on your own, or with help.